Happy Sunday everyone! It’s a cold rainy day here in Burlington. I felt bad for the Sound of Music festival parade which was today so all participators must have got drenched. For breakfast this morning I really wanted some granola on top of my bananas and peanut butter but sadly I did not have any. So out came the oats, nuts and fruits in my pantry so I could make some breakfast fruit and nut granola. 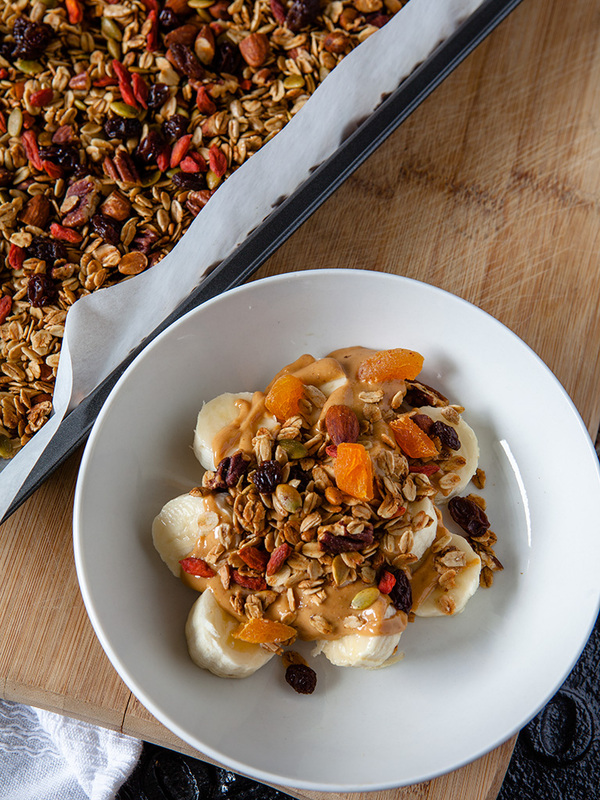 This granola is filled with rich nutritious nuts and dried fruits. 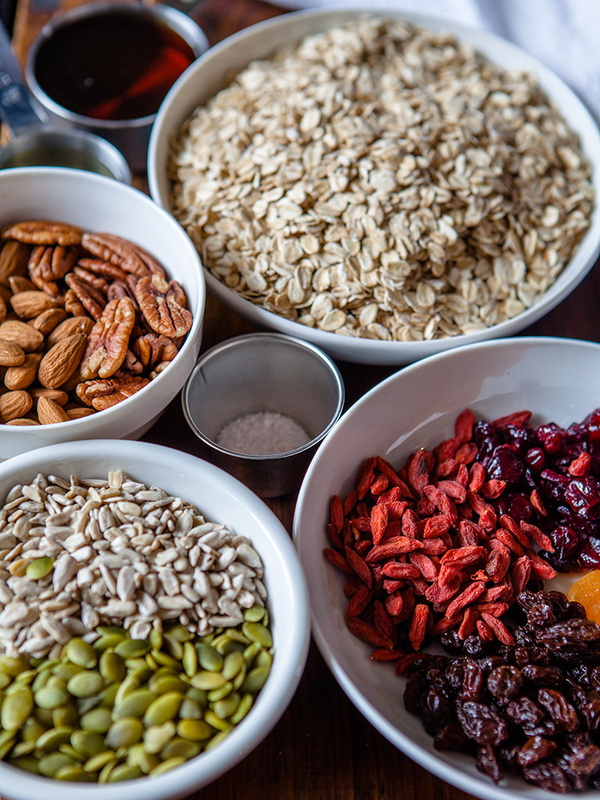 The great thing about granola is that you can add your favorite nuts and your favorite fruits. I used pecans, almonds, pumpkin seeds, sun flower seeds and a variety of dried fruits. This recipe is so easy to make, you want to make sure your nuts are in bite size pieces. 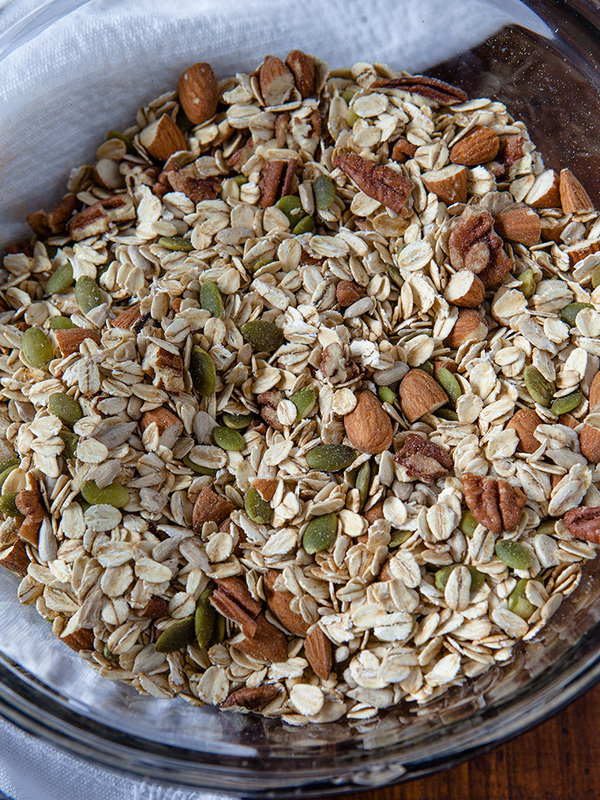 Mix together oats, nuts and seeds in a large bowl. Then add salt, melted coconut oil and maple syrup. You want to make sure that the ingredients are mixed well together. Do not add fruit at this point, you do not want to roast your fruits as they will become dry and hard. Spread mixture evenly on a parchment paper lined baking tray. Place in oven at 300F for 40 minutes. 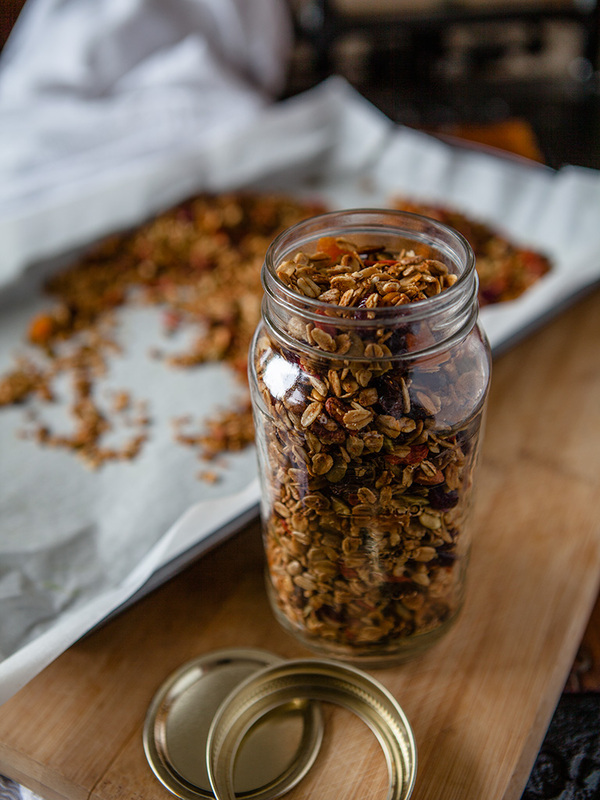 Make sure you mix granola after 20 minutes and keep checking every 10 minutes. Granola should be golden in color. 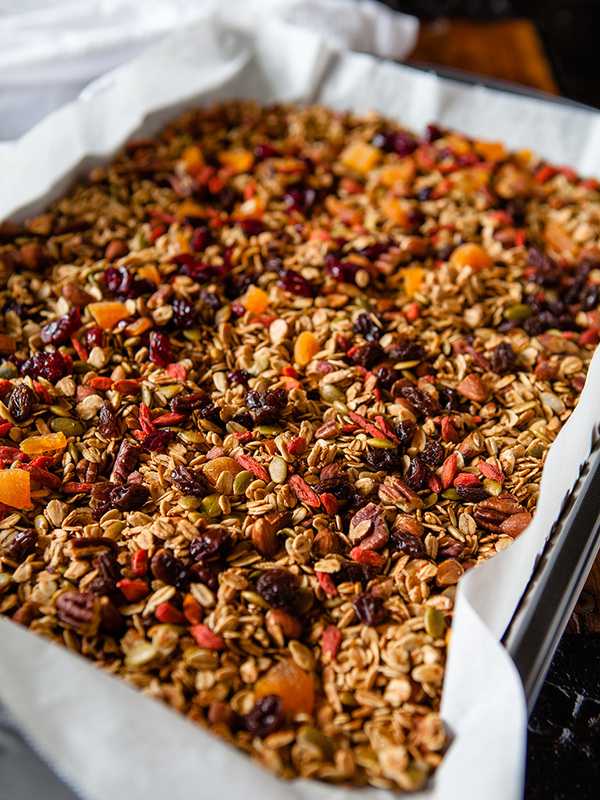 Leave granola to cool on tray then mix in fruits. When cooled it can be stored in air tight jars. Enjoy! I didn’t have my granola for breakfast but I did have it for snacks! In a large bowl put the oats, nuts, seeds, salt, and cinnamon. Mix together. Add maple syrup and oil. Mix well together. Spread out on a parchment paper lined baking tray. Bake at 300 degrees for 30-45 minutes, giving it a stir after about 20 minutes. 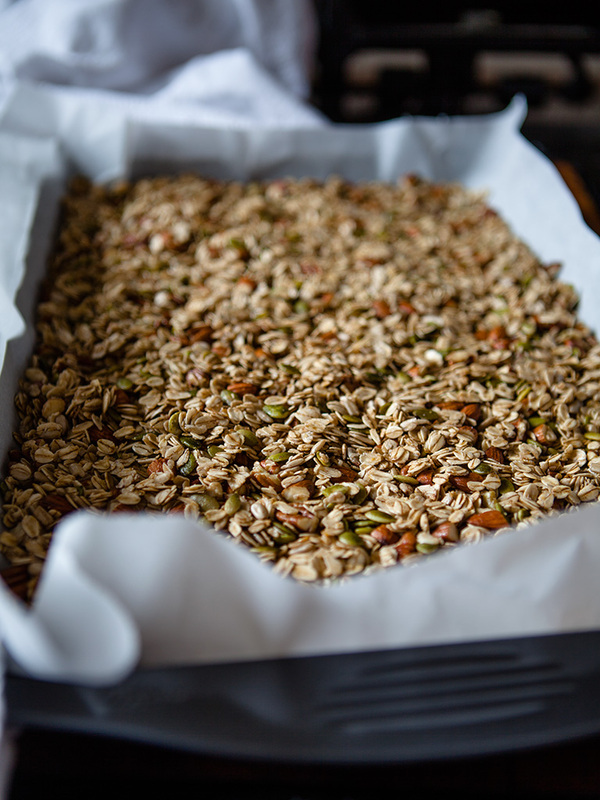 Leave granola to cool then add dried fruit.